We Create Digital Experiences That Help Your Business Grow. ViGyan is a promising breed of young-blooded, power-packed New Media & Technology enthusiasts, supercharged with unparalleled energy and a truly unconventional flair for all things Business Management. Bolstered by exemplary leadership & business acumen constituting over 25 years of distinguished Industry experience spanning across Marketing, Sales, Business Planning & Development, we are, at the very least – the definition of ‘Market Ready’. Based out of Ahmedabad Gujarat, we are a growth obsessed company with a rooted business network in the states of Gujarat, Delhi (NCR), Maharashtra, Rajasthan & Uttar Pradesh in cities such as Ahmedabad, Delhi, Vadodara, Rajkot, Surat, Mumbai, Pune, Nasik, Ahmednagar, Jodhpur, Jaipur, Udaipur, Kanpur, Lucknow, etc. Truly Digital at heart, we’re here to make an impact in the Indian business ecosystem, and in that, create lasting growth opportunities for businesses – small, medium & large. We aspire to achieve this and more with our ever improving range of robust market-ready solutions, converging at the intersection of Technology, Discovery & Experience. Our offerings such as 360° Virtual Tours & Videos, Website Design & Development, Digital Marketing (Search Engine Optimization & Marketing, Social Media Optimization, etc.) and Photography (Commercial, Product, Industry, Fashion, Wedding, etc. 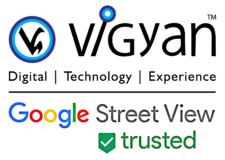 ), along with our association with technology giants such as Google on projects such as the ‘Google Street View’ give our resolve & promise of superior service quality & delivery enough strength to take up the mightiest of challenges in the best of spirits. In your growth, lies ours. Get in touch with us & together we’ll make sure that achieving growth is no more a challenge. HAVING A GREAT PRODUCT IS NOT ENOUGH, GREAT NOISE MUST BE MADE ABOUT IT ! Unlock immense Business Opportunities for horizontal & vertical growth of your organization. It is said that “A picture is worth a thousand words”. Storytelling remains incomplete without Photos & Videos. 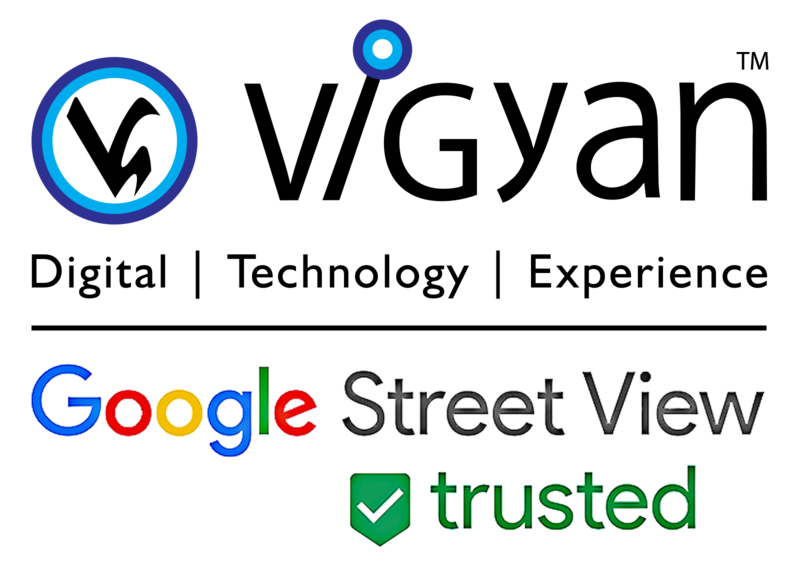 As Google certified “Trusted Photographer” ViGyan can create powerful virtual tours of a business place & promote them on Google Search & Maps. We also offer Commercial & Personal Photography & Videography Services using best in class Cameras, other photographic equipments & editing Softwares. The Website is a kind of must have business development tool in modern business practices. A well made website helps in building positive impression & trust among existing buyers & potential prospects of the organisation. It ensures that buyers gather important information about a company’s background, products or services any time they want. ViGyan is an expert in building CMS based websites for all types of businesses. A well known brand is welcome by all. Existing customers feel proud to be associated with it & prospects accept it easily. Platforms like Google Search, Google Maps, Google Plus, Facebook, LinkedIn, Twitter, Pinterest, Instagram are the super-fast engines to optimize reach among target prospects. We plan Organic & Sponsored Campaigns that create Brand Awareness & generate qualified business leads. Actions speak louder than words. What you do is heard more loudly than what you tell. We are proud to be associated with the businesses who believed in our ability to deliver what they desired. ViGyan is truly customer-centric. Their problem solving approach makes things even better. I’m quite satisfied with our association and hope to do more with their help in the future. If you have a business development plan, ViGyan can assist you in achieving your Goals. Just drop an email elaborating services you require to fast track growth of your business. And we will be happy to serve your needs. Message - Write about the services you need.